o you have a long journey coming up but feel worried about keeping your little one entertained for the duration? Whether you’re travelling by car, plane, train or boat, the thought of a confined child for a prolonged period, attracting glances riddled with judgement and silent loathing from fellow travellers if your child so much as makes a peep, is enough to make many parents wonder whether the journey is even worth it. We started doing long journeys with Theo when he was 10 days old (this first journey was the 327 mile drive from the Lake District to London for Christmas, which took 7 hours with a newborn) and he’s been on 24 flights to date, countless multi-day-long car journeys, and several long boat and train trips. We choose not to use screens to entertain him, so have no child-friendly apps and he doesn’t watch any children’s tv or films. That’s not to say that he won’t enjoy an in-flight movie when he’s older, and certainly no judgement if you do use screens, do whatever works for your family, but, if you want to travel screen-free, let me reassure you that it is possible. I’ve compiled a list of our favourite toys to travel with, all of which have been invaluable not just during long journeys but also to stick in a bag for when we’re out and about. Of course, you don’t need all of these; consider the length of your trip, the length of your journey, the age and development of your child or children, and your luggage allowances. It’s also worth remembering that children will play with anything and will find ways to entertain themselves that us adults won’t have even considered. Theo will happily run up and down the plane aisles, read the in-flight magazine and play with the tray table or remote control, but it’s useful to have a few toys on hand too. These are just our personal favourites and all of them are sustainable and ethically made. Tegu magnetic blocks are a firm favourite, both with Theo and with Alex. For toddler and engineer, the possibilities are endless! We have an 8-piece and a 6-piece set, plus a set of 4 wheels. These are small and light enough to make them practical for travel, but diverse enough in terms of colour and shape to provide options for imaginative building projects. Theo is really into vehicles so the wheels are an essential component of our set and worth forking out the extra cash for. The sets come in convenient felt pouches so individual blocks don’t end up buried and hidden at the bottom of rucksacks. Their internal magnets, as well as providing Theo with a sense of magical wonder when they click together, also reduce the potential for loss, and make it easy for little hands to manipulate individual blocks to form structures limited only by the imagination. Great for creativity and fine motor control, these blocks have no minimum or maximum age limit. The Grimm’s mini rainbow is a 6-piece wooden stacker, cut from a single piece of sustainable lime wood and naturally stained using non-toxic water-based colour. This allows the grain of the wood to show through the bright colours. A tiny and much cheaper version of the popular 12-piece rainbow tunnel and the larger 6-piece rainbow, the mini is a pocket-sized open-ended toy for all ages. ‘What is it?’ is a silly question posed only by adults. It’s a tunnel, a bridge, a car ramp, a boat, a rocking chair, a tower…it’s whatever your child wants it to be. 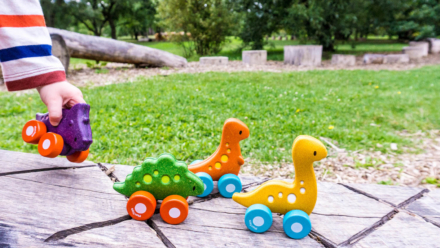 Our four Plan Toys dino cars have been taken on countless adventures! Plan Toys are made from beautiful, smooth rubberwood and come in dappled, appealing colours. These Dinos are the perfect size and shape for little hands to push up and down plane aisles, or along restaurant tables while waiting for your meal. Ours have also been out for competitive races along tree trunks and are taken to graze on park lawns. All Plan Toys products are made using either rubber trees that no longer produce latex, or Planwood, a material made by compressing the sawdust produced in the Plan Toys factory, ensuring that nothing goes to waste. The whole process is carbon-neutral and non-formaldehyde glue, organic colour pigments and water-based dyes are used to finish and construct the toys. Also by Plan Toys, we love the nuts and bolts. I bought this for Theo while travelling. He had developed a determined fascination with our Klean Kanteen bottle tops, insisting on twisting the lids on and off himself, and these seemed the perfect solution to potential spills and toddler frustrations at the lid being too tight. Screwing and unscrewing the large pieces on the bolts allows him to practise this skill without getting soaking wet, and can be played with anywhere. They are also designed in a way to allow imaginative play. We’ve built people and flowers with ours, and Theo finds it hilarious to wear them as funny noses! If your child likes threading toys, I highly recommend the Haba number threading dragon and the Bajo lacing fox. The dragon features ten chunky beech wood pieces, each numbered and painted with natural paint in rainbow colours, making it suitable for both younger travellers and those developing their counting skills. The fox, with smaller holes and two shoelaces to thread and tie, is more fiddly and therefore better for slightly older toddlers, preschoolers and primary-age children. Theo will concentrate on them both with such intensity and undivided attention, practising them until he’s mastered it. They’re both fabulous toys for developing hand-eye coordination and fine motor control. Lanka Kade make beautiful chunky rubberwood puzzles that range from just two or three pieces to large numbered and alphabet sets. We are currently playing with the three-piece elephant and four-piece train, which are compact, lightweight and ideal for Theo at the moment. I have a ten-piece numbered gorilla stashed for the future (he currently only knows numbers 1 to 3 and wouldn’t be able to identify these in written form yet), which I’m looking forward to watching him play with and will still be small enough for travel. I feel very proud watching him turn the pieces over, trying different orientations and celebrating with a big grin when he figures it out. We are big fans of Holztiger and Ostheimer wooden figures but, unless your child has one that’s a particular favourite, they are a bit too heavy to be practical for travel. We love Green Rubber Toys as a much lighter alternative. Their realistic animals are suitable from birth, made from durable natural rubber and non-toxic paints, and, with no holes to collect mould, they can also be used as bath toys. If your child enjoys peg puzzles, I can recommend Hape puzzles. The boards are smaller than some other brands and can easily be slotted down the back of a rucksack. I store the pieces separately in a little drawstring bag, which Theo can access as and when he wants it. Puzzles like these don’t seem like the ideal travelling toy, but can be broken down to make storage easier. They are ideal for those practising their fine motor control and problem solving. Plan Toys tins are great for older toddlers, preschoolers and primary age children. There are six different tins available; we have only tried the mini balancing cactus (here is the larger version). Theo loves trying to build the cactus by carefully slotting each piece into the last. It retains his focus and concentration, but the base moves easily on smooth surfaces so it can also be frustrating for him. It will topple less as he learns to apply his strength appropriately for different tasks, but for now knocking it down on purpose is a great game! In the coming months and years, I expect he will start to enjoy playing this as a game with other people: who can add or take away a piece without tumbling the rest? ÖkoNorm do a full range of crayons, colour pencils, paints and modelling clay, all made with non-toxic, renewable materials. They even have vegan options as an alternative to their beeswax crayons. Colouring is a constant hit while travelling, and it’s a joy to see Theo be creative, explore mark-making and develop his pencil control. The clay does get in fingernails, so have some cloth wipes handy, but it’s a great artistic outlet that’s practical for confined spaces, and can be stored and reused. I have gone back and forth on whether or not to include the Plan Toys first shape sorter on this list so I’ll pop it in here as a sneaky eleventh item. We like it, but we don’t love it. While it is a wonderfully compact toy that is great for developing skills in shape sorting and colour matching, it can also be quite frustrating. The string that links the three coloured shapes together and connects them to the base, is too short in my opinion. It can be tricky for Theo to manipulate with ease and he finds it confusing that the string can block him from pushing the shape through, even when he has it in the correct orientation. Without the string, it would be like any other shape sorter and would be disastrous for travelling; I have visions of bruised individuals, angrily shouting that they’ve had a wooden cube chucked their way yet again. With the string, however, it is very restrictive, but has nonetheless helped Theo practise shape and colour identification. So there is my list of our favourite eco-friendly toys to travel with. Of course, all children are different and you may have other tried and tested suggestions that work for your family. I’m always keen to hear new ideas so please feel free to add to this list by commenting. Books, stickers and snacks (lots of them!) also go down well here! If you’re new to travelling with young children, don’t let the thought scare you. People are generally very understanding that children cannot sit still in the same seat for hours at a time (nor can this adult!) and that, when travelling by plane, their ears will pop (I tend to breastfeed during takeoff and landing to minimise this). You will likely find that at least a few fellow passengers and airline staff want to help you entertain your child and will happily play peekaboo over the seats. You never know, even the most sleep-hating child may drift off to the hum of the engine, and if not, I hope you see something on here that you think your kids will enjoy! Where can I buy these toys? The in-text links will take you to the item listing on www.amazon.co.uk. I receive a small commission if you buy something using these links (but not if you leave the page and then go back to it later). This enables me to keep writing this blog and producing useful information. However, I prefer to use independent ethical retailers. I always recommend www.babipur.co.uk as a great place to buy eco friendly toys, clothes, reusable nappies/diapers and sanitary products, slings, household items and toiletries. They are a trusted ethical retailer and you can rest assured that they’ve done their research into the best eco brands and products on the market; everything they stock is made from sustainable materials and the manufacturing processes are both socially and environmentally ethical. Their customer service is second to none and their online presence is friendly, personal and transparent. I have always received purchases in double quick time and everything arrives in recycled or reused packaging. Spend over £40 for free UK postage, and international postage is very reasonable. Top marks all round!